"...And I don't see why leftists should be able to promote open borders, mass migration and a large influx of refugees and then say "but I don't want my own child to be negatively affected by this"." It isn't JUST their children; THEY ALSO don't want to suffer from the negative effects of their impossible and unworkable demands so that they can make themselves feel more 'tolerant' and 'accepting' than anyone who disagrees with them on anything. The classical case of the 'NIMBY' ("Not in MY backyard!!") at work. Leftism goes together with lying and hypocrisy like peanut butter and jelly. Yes, good comment. They want the "feelgoods" for themselves but not the negative effects. People who promote this ultimately genocidal policy for other Whites need to be held accountable. And for many, that must mean financial punishment AND being made to live in these 'diverse' areas they push so readily for others. And live there permanently, NO escape. After all: Is what they promote even so innocent as they pretend? ii) anti-white hatred of the civilization they takes for granted. iii) status seeking over others to manipulate and control them, gain resources from them, shape them like tools to their ends. iv)indifference to the interests of ethnic Whites while demanding that very accommodation for others. The list goes on: do not overlook them. Perusing some of the comments on the article, there's a lot of "doing what's best for MY children" in response to accusations of racism. Nothing unusual here. Parents know the pressure is on to succeed in this liberal modern paradise of haves and have nots. Tellingly there's is no attempt to critique any further than "too much immigration". The dystopian reality of different racial and ethnic groups colliding and competing in a managerialist, market driven society is present but largely unexamined outside the scope of "in what ways can we tinker with the current system and how much money do we need to pour into this 'problem' until it goes away"
But the problem will never go away, as surely as different ethnic groups will never "go away"
"When I moved to Melbourne I sent my son to one off the schools mentioned in the story. After 1.5 years it became apparent he didn't fit in socially and wasn't doing well academically so we moved him to another inner city school that more matched the demographic we are in. He is now thriving both socially and academically. The import this here is that I just want to do what is best for my son, it's not racially or politically motivated, who I vote for is completely irrelevant (it is the Green by the way, what other choice do I have?). My son's happiness and well being is the important point." So this Age reader admits he is a Greens supporter (the Australian Greens are for expanding the refugee programme). He sent his child to a school with the refugees for a year or so, but things didn't go well. But instead of facing up to the issues of the refugee programme he talks instead of wanting his child to be in a school that "matched our demographic" (i.e. wealthy white liberals). It's a kind of doublethink, isn't it? 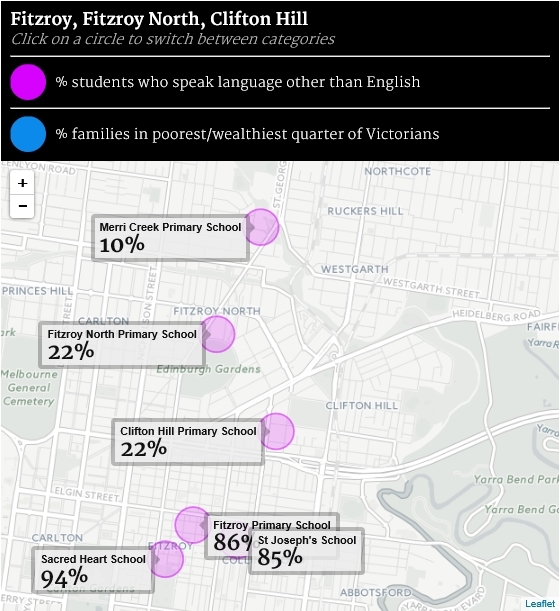 This Greens supporter would say it is "discriminatory" to have an immigration policy that matches Australia's existing demographics, but that it is OK for him to search out a school for his child that matches his own demographic. Also, if these leftists want what is best for their sons, why push a "rainbow coalition" politics that is designed to displace white men? Why push a feminist politics that sees white men as the enemy? Why push a politics that further dissolves family life? The sons of these families are going to be put at an ever greater disadvantage because of their parents' politics. They obviously lack the insight to think beyond the present, or are deliberately suppressing the contemplation of it. It doesn't require any particular genius to calculate that as the relative numbers of the ineducable increases it will be correspondingly increasingly more difficult and expensive to access schools of a desirable ethnic profile. The result will be a slow, irreversible decline of such regions to the original societal levels of the refugees. Zimbabwe is a good illustration, a land which offers few opportunities for the soft, dream life-style of the modern liberal. At least they'll get closer to nature. The comments are hilarious. My favourite is the one that informs us that it's not the migrants they're worried about, it's those dreadful poor whites. It's a breathtaking example of the venomous hatred leftists have anyone who isn't middle-class. Here's another thought: these people are determined for their social class and subculture to survive (wealthy, white liberal), but not for their larger ethny or nation to survive. They identify with the one but identify against the other. It's not going to work out in the long run. It does seem like an intractable problem for liberals. One the one hand they have to studiously avoid mentioning the reality of ethnicity and race, and on the other hand the reality of underperforming minority groups is being thrust into the spotlight as a problem that the government needs to address, even if that means forcing parents to send their children to schools where they know their children they will be treated very differently, and will probably suffer for that treatment, due to their ethny and background. I note too that one commenter, having given an eminently reasonable explanation for not sending their children to an underperforming school, is promptly accused of classism. Lose-lose. "Very poor attempt at rationalising what is the very definition of racism, and in the process also displaying for us what hypocrisy means. "didn't fit in socially" and moving to "another inner city school that more matched the demographic we are in" are just code words, a more polite way to say "we wanted to be with people who are more like us and speak our language". So you are discriminating based on race and culture, are you not? Probably a radical humanist; ironically they seem to be ones who pop up in comments and aggressively deny people a guilt free relationship with their own ethny.